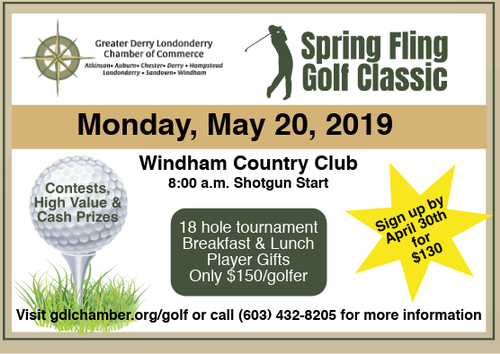 Join us for the Greater Derry Londonderry Chamber's Annual Spring Fling Golf Classic! The tournament takes place at picturesque Windham Country Club. Entry fee includes 18 holes of golf, breakfast, lunch, amazing gifts, access to raffle items, networking and more! Early Bird Pricing: Register by April 30th to receive $20 off.